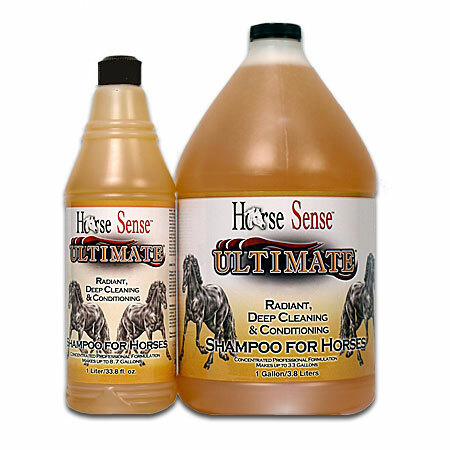 Ultimate® deep cleaning and conditioning shampoo for horses is the perfect choice for deep, thorough, yet gentle cleaning. Removes stains and yellowing. Deodorizes. Unique synergy of natural coconut based surfactants gets all the dirt out and leaves the coat lustrous and shiny. Improves health by unclogging pores and restoring the skin's vitality. Extreme concentration creates great value! Long-lasting results with animals looking, feeling and smelling great long after Ultimate® is used. Humectant and emollient rich formula is easy on your hands and enriches the animal's skin. May safely be used regularly for beautiful, show ring results. Also great for dogs, cats, cattle and most other animals.